-Rainwater harvesting: This can be as simple as a barrel beneath your gutter or as complicated as a catchment system with a cistern. -Grey water. Water from sinks, bathtubs, showers and washing machines can be captured, filtered, and used on landscapes. 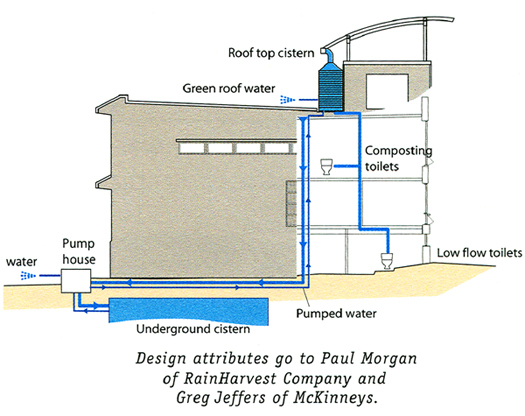 The water from a roof is transported via the gutter and downspout to a cistern. The water then flows through a simple gravity run delivery system to the garden.....or toilets via a more elaborate system. The cost can vary from $100 to several thousands of dollars, depending on how big and how complicated you plan to make the system. The largest cost of the system is the cistern container. Construction costs can range from $250 to $2000, but this cost can be reduced drastically by purchasing barrels previously used for food products or simply picking up a canister at local farm supply stores. Since it's a fairly static system, it requires minimal, but regular maintenance. Keeping the debris from the gutters and leaves out of the canister is all that is needed. The size of a rainwater collection system depends on the size of the roof-section(s) you're collecting from, the amount of rainfall, and the water demands from the system. For the average homeowner it is best to start with one canister bought at your local Farmers outlet, secure it well on a level and flat surface, such as 4-8 cinder blocks. The hardest part will be sawing off the existing drainpipe to the correct height and attaching the properly chosen bends and drainpipe sections that lead to the canister. Place the cistern elevated approximately 2 to 4 feet on a sturdy, load-bearing foundation or structure. This will create enough pressure to use gravity for running the water through a hose, soaker hose, or drip irrigation system to the landscape. Foundations can be made of bricks, concrete, or a wood frame. Remember, a full 55-gallon cistern will weigh around 500 pounds. --Setting up a conveyance system with a large particle filter between gutters and cistern. o Install continuous leaf screens, made of ¼-inch wire mesh in a metal frame, above the gutters to prevent debris from entering the system. o Place a basket strainer (e.g. a screen or wire basket) at the top of the downspouts (optional). Make the downspout out of 4-inch diameter Schedule 40 PVC pipe or comparable piping. Angle bends should not exceed 45 degrees. Slope the piping at ¼-inch slope per foot minimum. o Adapt the gutter to PVC piping with a downspout adapter. o Place pantyhose or other filtering system before the head of the cistern to filter out debris from the roof. Set up a distribution system to remove water from the cistern to the landscape. Place a faucet near the bottom of the cistern with a hose connection. Do not place at the very bottom because sediment will accumulate there. Drill a hole into the cistern for the connection and install a ball valve. Seal the area completely around the hole with aqua or water resistant sealant. (Sealant can be purchased at a hardware or pond supply store.) Enough pressure is generated to run soaker hoses and drip irrigation systems from a cistern that is elevated 4 feet. A pump may be needed to create enough pressure to run sprinklers, which require a higher amount of pressure. -Water with algae growth can still be used for landscape watering, but it could clog up the system or slow down water flow. Cleaning the system on a regular basis, placing the cistern in the shade or underground, or using dark barrels will help discourage algae growth. -Clean gutters on a regular basis to maximize the water-flow to the canister. -Containers can be found at farm supply stores, local hardware stores, or on the Internet. Usually, unless you place the barrel several feet above the hose outlet, an auxiliary pump may need to be installed to generate enough pressure for a sprinkler. A drip irrigation system, which uses less power and water works best unless you prefer to use a Solar powered pump for your sprinkler. Is grey water legal? In practice, grey water legality is virtually never an issue for residential retrofit systems. However, grey water legality is almost always an issue for permitted new construction and remodeling, unless you're in a visionary state such as Arizona or New Mexico. 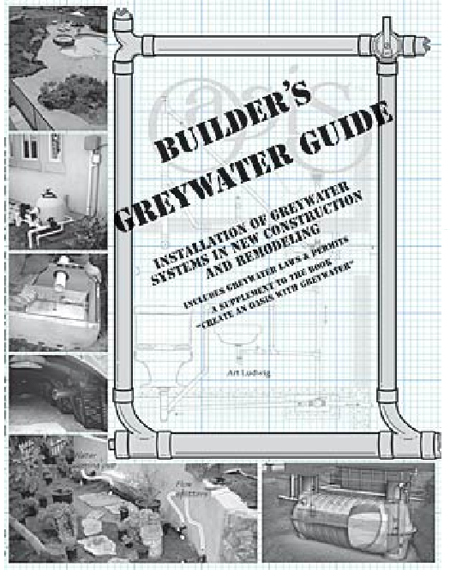 For details see our Grey water policy center and Builder's Grey Water Guide (book). Grey water can replace fresh water in many instances, saving money and increasing the effective water supply in regions where irrigation is needed. 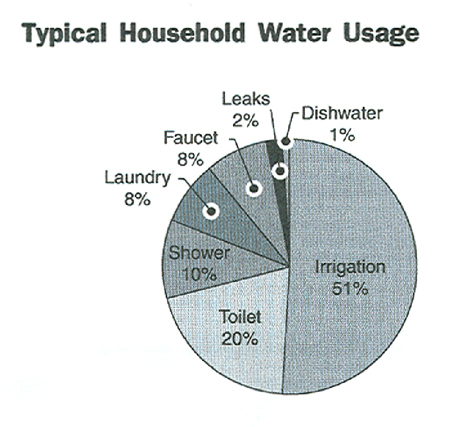 Residential water use is almost evenly split between indoor and outdoor. All except toilet water could be recycled outdoors, achieving the same result with significantly less water diverted from nature. Grey water use greatly extends the useful life and capacity of septic systems. For municipal treatment systems, decreased wastewater flow means higher treatment effectiveness and lower costs. 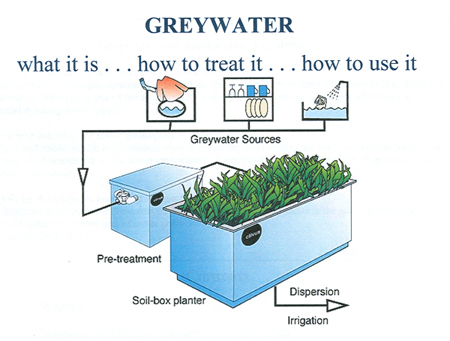 Grey water is purified to a spectacularly high degree in the upper, most biologically active region of the soil. This protects the quality of natural surface and ground waters. For sites with slow soil percolation or other problems, a grey water system can be a partial or complete substitute for a very costly, over-engineered system. Less energy and chemicals are used due to the reduced amount of both freshwater and wastewater that needs pumping and treatment. For those providing their own water or electricity, the advantage of a reduced burden on the infrastructure is felt directly. Also, treating your wastewater in the soil under your own fruit trees definitely encourages you to dump fewer toxic chemicals down the drain. Grey water application in excess of plant needs recharges groundwater. Grey water enables a landscape to flourish where water may not otherwise be available to support much plant growth. Loss of nutrients through wastewater disposal in rivers or oceans is a subtle but highly significant form of erosion. Reclaiming nutrients in grey water helps to maintain the fertility of the land. Grey water use yields the satisfaction of taking responsibility for the wise husbandry of an important resource.